Here are the candidates for Old Hastings in their own words. I’m proud to have represented Old Hastings for the past two years and to be a candidate again. I am Hastings born and bred my roots are in Old Hastings, going back to my great-great grandfather who was Biddy the Tubman. I’ve had a fulfilling career working with children in local primary schools and as a Community Fundraiser at St Michael’s Hospice My passion is for helping the community and I get stuck in to all aspects of Old Hastings life. Being your Councillor has been productive and rewarding and I hope to continue to represent you. RNLI Lifeboat Crew, RAC Patrolman, and father of two children. Having grown up in Hastings, watching the town grow and evolve Alan decided that it was his turn to try to make a difference. Alan wants to tackle local issues head on, and take matters to hand to make a real noticeable difference. He aims to make Old Hastings a better place to live, work and visit. I am a landscape architect and artist and have lived in Hastings for ten years. I love the energy of the town but it’s clear that there are many local campaigns that need a champion on the council. I oppose the harbour development and am working to build support for a more positive vision for the town including the idea of making Hastings a UNESCO world heritage site. I am involved with the Greenway group, the Sustainable Transport Forum and Fossil Free Hastings. I am also a non executive director of Energise Sussex Coast. All of Hastings is special, but Old Hastings has its own distinctive character, charm and issues. It makes a huge contribution to quality of life for residents across Hastings. 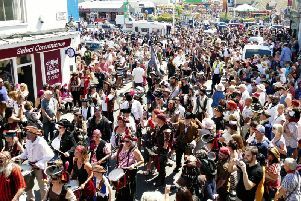 The sheer number of homegrown arts events and festivals every year helps make the Old Town what it is, as well as adding to Hastings’ growing reputation as somewhere to pay attention to. But wonderful as the Old Town is, the ward is bigger and includes Clive Vale, the Country Park and the allotments. I pledge my attention to the whole ward, and I am looking forward to working with residents to address your concerns. I am a long-time peace and environmental campaigner. I’ve lived in Hastings for 15 years and am qualified as a nurse although currently work as a writer. I was a school governor for five years, and volunteer for Snowflake and the Cinnamon Trust. I’ve spent much of the last five years holding local ‘regeneration’ company SeaChange Sussex to account, and I run the seachangewatch website. I’m totally opposed to the proposals to destroy Rock-a-Nore with a harbour complex and 1,300 luxury homes. Lisa lives with her husband and son in Hastings and wants to see an improvement in the way the Council is run. She would also like to see the streets be cleaner and the re-instatement of toilets in the town centre and the re-instatement of planning notification letters to residents.